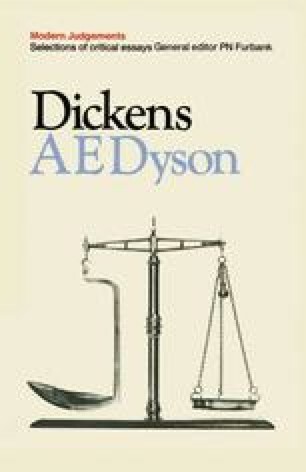 In his famous defence of Dickens, first published in 1906, G. K. Chesterton argued that at the turn of the century Dickens’s reputation had suffered because criticism was analytic, self-conscious and descriptive in approach, and therefore was unfitted to deal with the comic simplicity of a Mantalini or a Micawber. Chesterton forecast that as time went by, Dickens would be recognized as the greatest of the Victorian novelists, standing above Thackeray, Charlotte Brontë, George Eliot and Thomas Hardy. Chesterton’s prophecy has not yet come true. Modern critics are usually still analytic, self-conscious and descriptive in their treatment of literature, and they prefer the novels of George Eliot and Henry James, who possess these very same qualities, to the exuberant writings of Dickens.